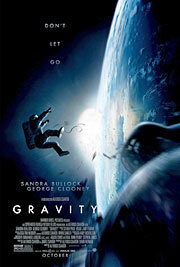 There are so many appropriate words to describe “Gravity,” yet none of them seem adequate. To call it intense – and boy, is it intense – puts it in the same company as movies about serial killers and runaway buses. To call it bittersweet and uplifting brings to mind “Steel Magnolias.” (It’s nothing like “Steel Magnolias.”) It’s also mind-bogglingly gorgeous, and yet, it’s more than that as well. So forget those words, and remember this one: the movie is magical. It’s the kind of movie that will inspire a generation of kids to grab cameras and let their imaginations run wild, the proverbial face that launches a thousand ships. At the very least, it will raise the profile of director Alfonso Cuarón (“Harry Potter and the Prisoner of Azkaban”) in a way that his previous film, 2006’s brilliant and criminally overlooked “Children of Men,” should have. Ryan Stone (Sandra Bullock) is on her first space mission. Matt Kowalsky (George Clooney) is on his last. Stone and Kowalsky are on a spacewalk, the former trying to fix a piece of equipment she helped design, the latter simply trying to set the record for longest spacewalk. Mission Control informs them of debris from a damaged satellite headed their way and orders them to get in the ship. The debris arrives too soon, however, and shreds their space shuttle beyond repair. Ryan and Matt are the sole survivors of the assault, adrift in space, and have limited amounts of oxygen and time to find a nearby, functional spacecraft before the debris makes its way around the earth and bombards them again.